The alarm rang at 4.00am for our early flight to Bagan. The airport was quite busy as nearly all internal flights take place in the morning and very few in the afternoon, once the planes have returned to Yangon. Check-in was extremely efficient and we were in the departure lounge within fifteen minutes of arriving, if not ten. The flight due to leave at 6.10 took off several minutes early and we landed at the airport that serves Bagan at 7.15 where the disembarkation and baggage collection was equally efficient. 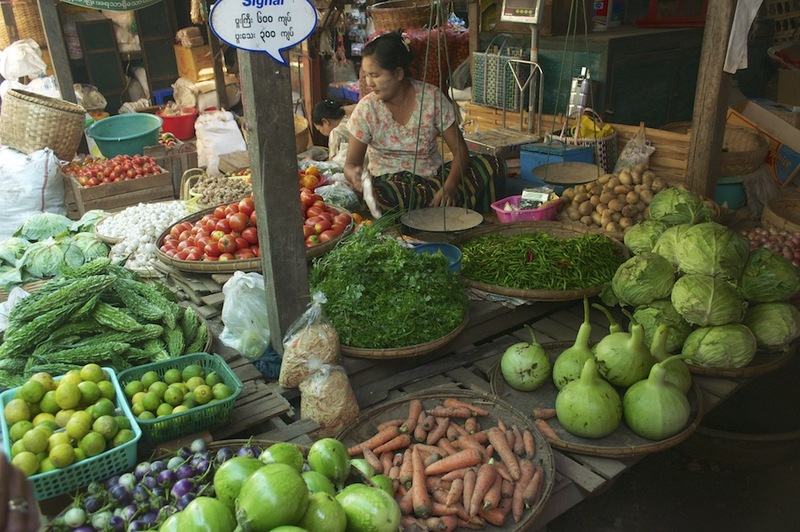 From the airport we drove to Nyaung Oo Market, a market largely catering for locals but with some stalls to capture the interest of tourists. 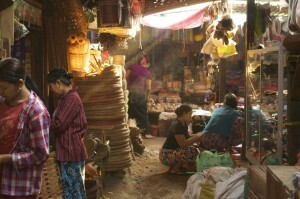 There is a hugely diverse range of stalls and they tend to cluster together according to products for sale. Thus, all the fruit and veg. stalls were together with their colourful array of exotic and not so exotic. Sitting amongst it all were the women chatting noisily to each other, laughing and enjoying the occasion, even though they do this every day. They did not mind us being there, walking among them and taking photographs as if they understood our interest and knew that we would be gone fairly quickly. The meat and fish stalls were all clustered together with the women sitting among their fish or cuts of meat. It did not matter how much they wafted their fans they could not keep the flies off. For the squeamish it was all a little too in your face, particularly the displays of offal. Some stalls attracted our interest, and hence encouraged conversation with the stall holder, when we were at a loss as to what they were selling. The Betel nut in its various forms was one such item. Many of the people we had seen were all chewing on them, their mouths stained red. In places the ground was stained red where people regularly spat. Often, when people smiled at us we were faced with a mouth of severely stained teeth. I was interested to know whether it was addictive, like smoking. It is, and the consequences of can be very serious with cheek cancer being one of the possible effects. We had most fun with the stall holders selling clothes, souvenirs and musical instruments. They, without being at all pushy, were most eager to sell things to us. They would readily enter into conversation with us, allow us to handle the goods, play with it if was a musical instrument and generally have fun. Inevitably the conversation would lead to where we were from and then degenerate into teams of the Premier League. It is a known fact that Man. Utd. has more supporters around the world than it has in the UK. 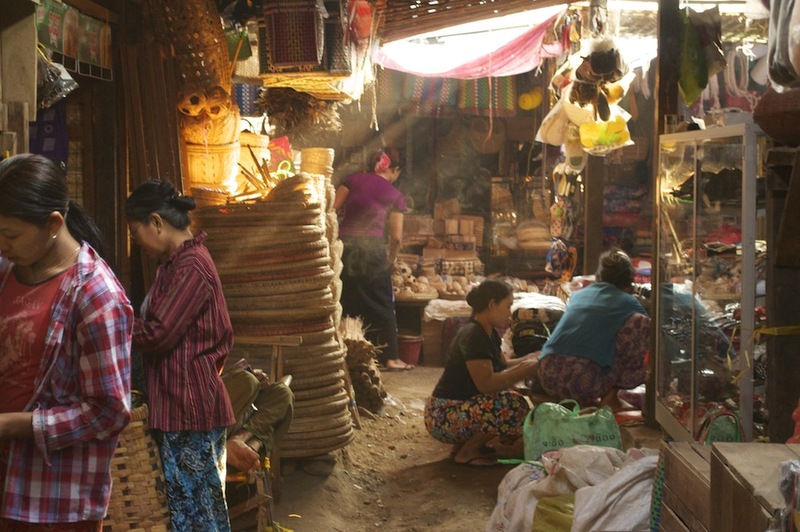 Since our arrival in Myanmar we had noticed many girls and women wearing a creamy coloured paste on their cheeks, foreheads and noses. The sun is so powerful that it can cause serious problems. Made by mixing the bark of the Thanaka tree with water and working it into a paste so that can be smeared on the face, it protects sensitive skin from the sun and helps keep it young and fresh. 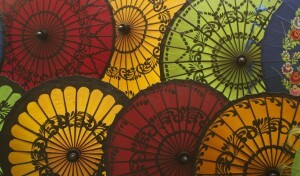 Interestingly, as with many Asian cultures, there is a desire for pale skin, while we all look forward to a healthy tan. It was impossible to keep my wallet in my pocket and I bought a chime bar and a frog soundbox that actually sounds like a frog. I thoroughly enjoyed the banter and the barter. 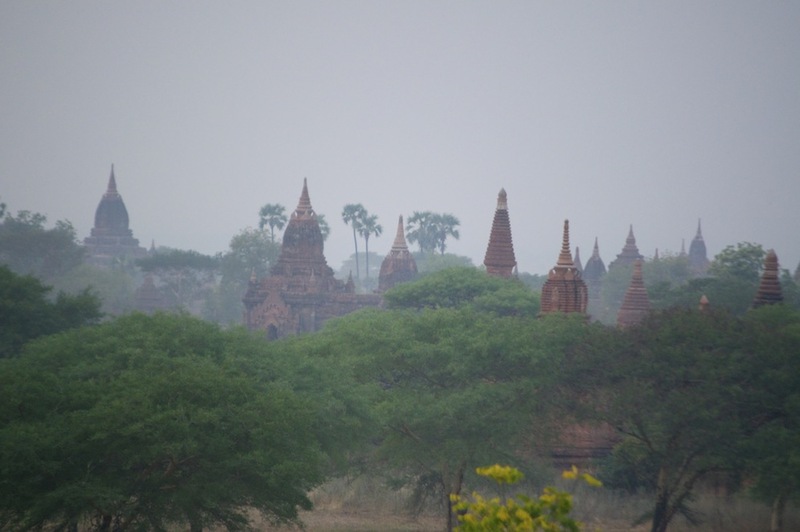 In a period of three hundred years from the 11th C, thirty one kings ruled in Bagan. 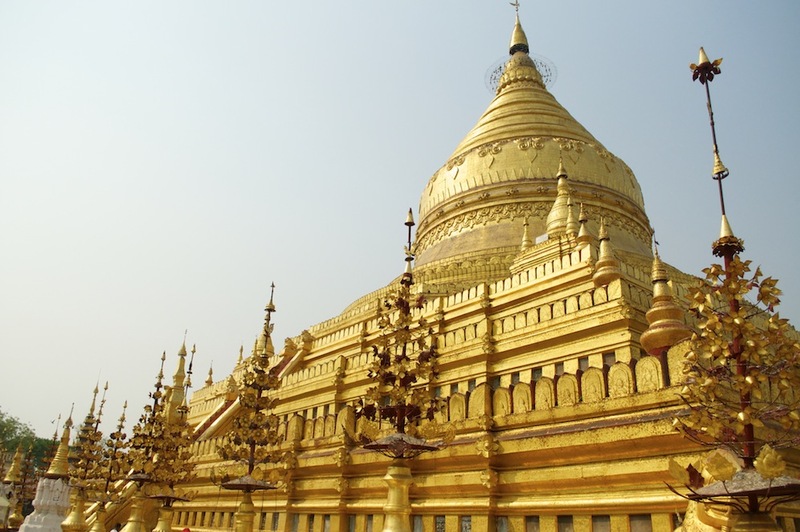 Each king and members of their families built temples and pagodas within the area. 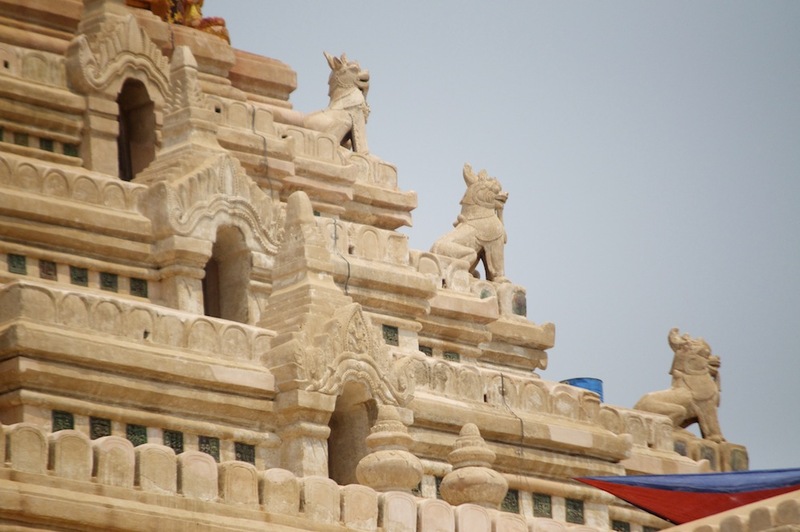 Other people followed suit on a smaller scale until there were over 55,000 temples. Subsequent human and natural activity has taken its toll and reduced that number to around 3,000. The Moguls were the first to plunder them expecting them to harbour treasures within. Locals similarly plundered them over the centuries. More recently the Japanese during their Second World War occupation and an earthquake in 1975 have added to their demise. It is an incredible sight. I cannot begin to understand what it would have looked like with 55,000. While a few are made of stone and plaster with a little gold leaf, the majority are made of brick. 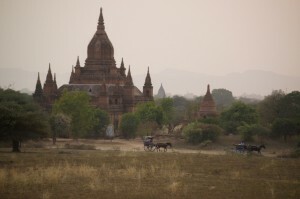 The bricks were made in villages along the banks of the Ayeyarwady River. The kings wanted nothing but the best so the brick makers were forced to have the name of their village cast in the brick. Sometimes even the brick makers name had to be cast. This ensured only the very best bricks were made and if they were not good enough the king would know who to reprimand. Not all the kings were compassionate. The one who had the largest temple built had the architect killed upon its completion so that he could not build anything bigger. 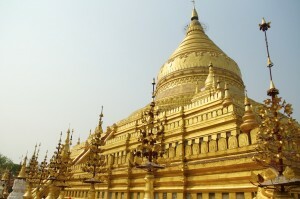 Swesdagon Paya, a golden temple glowing in the morning sun was the next place to be given our attention. 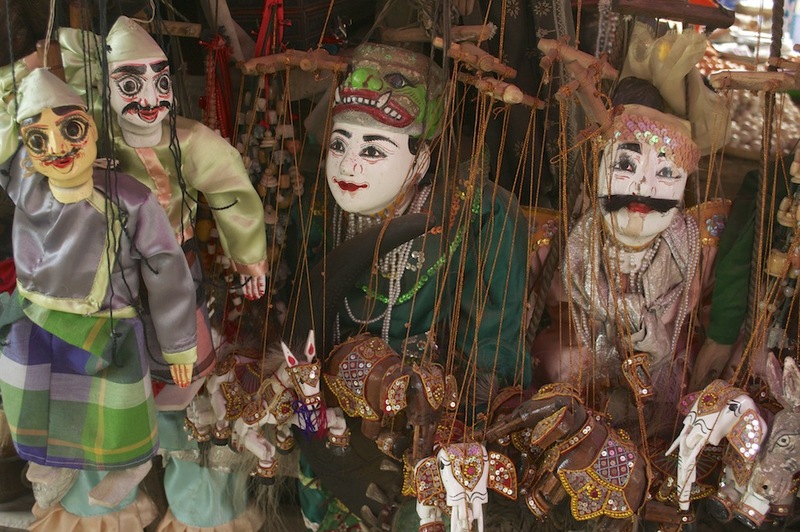 Entry is by the now inevitable corridor of stalls selling religious and non religious items. Again there was no pressure from the stall holders to buy but the hawkers who moved about amongst us were a little more persistent but soon moved on when they realised they weren’t going to get a sale. The pagoda was far less cluttered and the peripheral temples much more basic. Some devotees, including some nuns were carrying little cards of gold leaf and as they made small donations of food to various icons they also plastered on little squares of the precious metal. It was here that we were introduced to Nats, spirits whom Buddhists seek help from. There are thirty seven Nats who during their lifetime became martyrs for some reason. There are Nats for every occasion, including one for gambling and drinking. When those who believe, and not all Buddhists believe in spirits, they visit the particular Nat they need, pray and give a donation and they find the answers they need. Younger generation Buddhists are more sceptical. 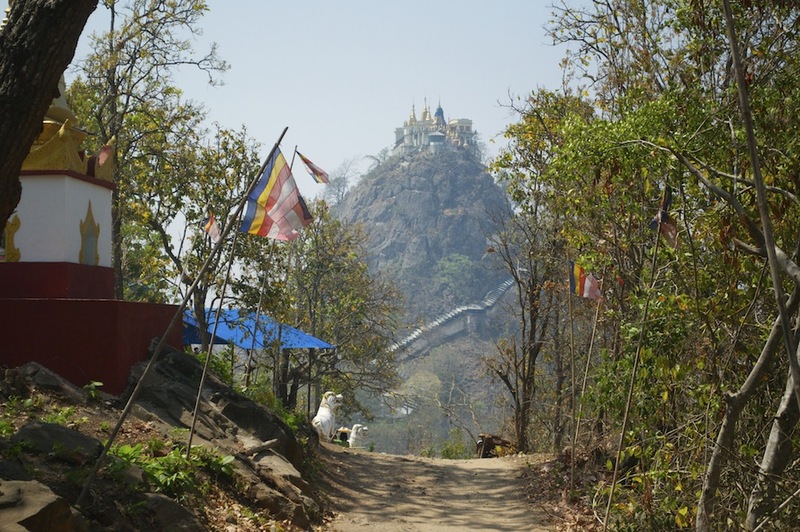 From there we travelled across the dry, dusty, water starved landscape passing numerous small temples and pagodas to Hdilominlo with sitting Buddhas and murals and on to Ananda Paya, known for its fabulous architecture. It is very large and the outside is going through a period of renovation, of crumbling stone being replaced and the whole facade being cleaned. The inside consisted of two passageways, an inner and an outer, going round the central core. In each of the four major compass points there was a large chamber housing a huge statue of standing Buddha. The walls, plastered and covered in very faded frescos had been damaged over the centuries, more recently by people taking prints off them and diminishing the quality. One of the four statues was different to all the others and unique to all other statues of Buddha. If you stood at a distance and looked at the face the lips were smiling but as you walked closer the position of the lips changed and the smile was replaced by a much more serious expression. This denotes the pleasure of becoming a devotee but stresses that it is also a serious commitment. 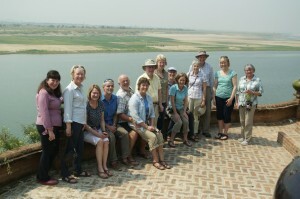 For lunch we went to a restaurant on the banks of the mighty Ayeyarwady River. Now, there have been many months of dry weather and the water levels are low. Nevertheless it is still a very wide river with many channels, but in the rainy season there is so much water going down that it would be impossible to see the far bank. Large areas of, now dry farmland, would be consumed by the water, depositing fresh silt and making it very fertile for the next growing season. 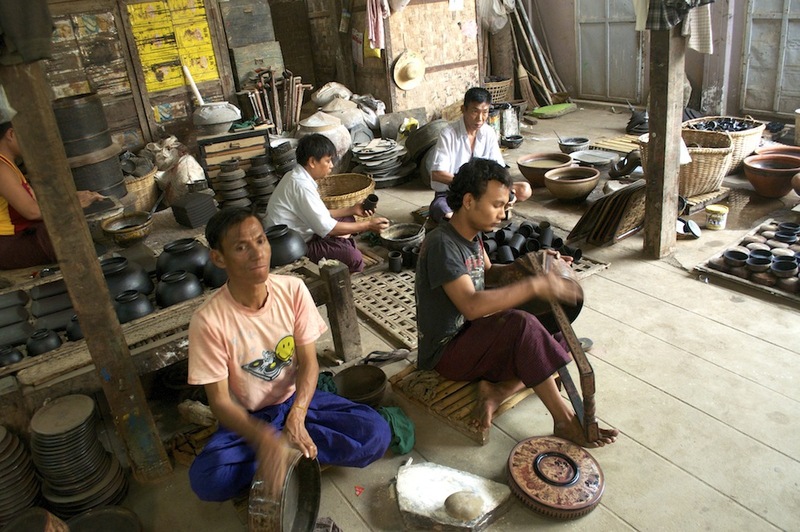 Later in the afternoon we visited one of the many lacquer factories in Bagan. This is a craft that is particular to the area. A workshop at the front of the premises demonstrates the various processes that lead up to the finished article. Making the initial framework of thin bamboo is a skill in itself, particularly if it is mixed with horse hair so that the finished product is flexible. The artwork which decorates the various pots etc. are also incredibly intricate and take a long time to create and then transfer, first by sketching and then by scratching into the surface of the lacquer. Having witnessed the various processes we then had to go into the inevitable sale room full of fantastic pieces way beyond our pocket. However, there were some things within our reach and we were tempted into buying a few items. Within the Bagan area there are a number of popular places to watch the sunset from. Some become very crowded. We wanted to avoid the crowds so we went to a smaller brick built pagoda from which to watch it. There were a few others who came to join us but it was far from crowded. The brick work was a bit crumbly around the top which made walking around it a bit precarious. Unfortunately the sun let us down and disappeared into distant cloud and haze before it could give us a setting glow. 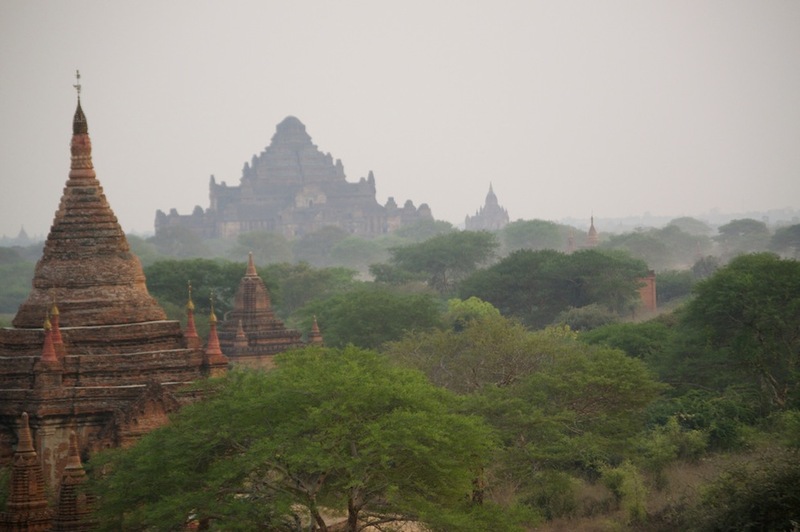 The mist which began to swirl gently around the trees and pagodas created some atmospheric pictures which made it all worthwhile. After breakfast, the next morning, our guide Girou, who had been with us from the start, had to leave and he introduced us to our new guide, Uza, a much more attractive replacement. Girou had been good but if he could be faulted it was because he tried to give us too much information. With Uza now guiding us we travelled to Mt. Popa, an extinct volcano about ninety minutes away. On the way we spotted some village activity and stopped to have a closer look. An oxen was being driven around in a circle, the hub of which contained a pot with peanuts in. The grinding action turned the peanuts into a paste and produced peanut oil, regularly used in cooking. Around the small farm were some palm trees. One had a bamboo ladder up one side. 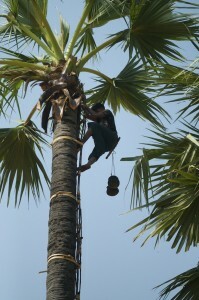 A young man climbed to the top of the tree to retrieve two pots hanging strategically and to install two fresh pots. Having climbed down he showed us the content of the pots and allowed us to taste the sweet sugary liquid. They were only two pleased for us to show an interest and we were allowed to have a go at driving the oxen. On a little table were grasshoppers and flower heads expertly made from strips of dried palm leaves. These had been made by the children of the farm. The hot dry season is when they have three months holiday from school, so they become involved in the everyday activity and use spare time to make these little items, which have to be bought. We left amid smiles and waves. Mt. Popa loomed out of the mist. We were not actually going to the top but to climb a volcanic plug rising from its slopes. From a distance the pillar of rock looked impressive with its staircase twisting its way to the top. However, it turned out to be a little disappointing. It is supposedly the home of the Nats, or spirits, but while we saw some I cannot account for all thirty seven. It was messy on the top in respect of the way the temples are laid out and also in the way the place is kept. It does not help that the place is infested with a troupe of aggressive monkeys, only too eager to attack a passer by. There are signs telling people not to feed them but then there are stalls selling corn and nuts to feed to the monkeys. Their debris litters the steps which then sticks to bare feet. The nuts make the monkeys thirsty and as there isn’t a readily available water supply for them, anybody carrying a bottle of water is particularly vulnerable to attack. 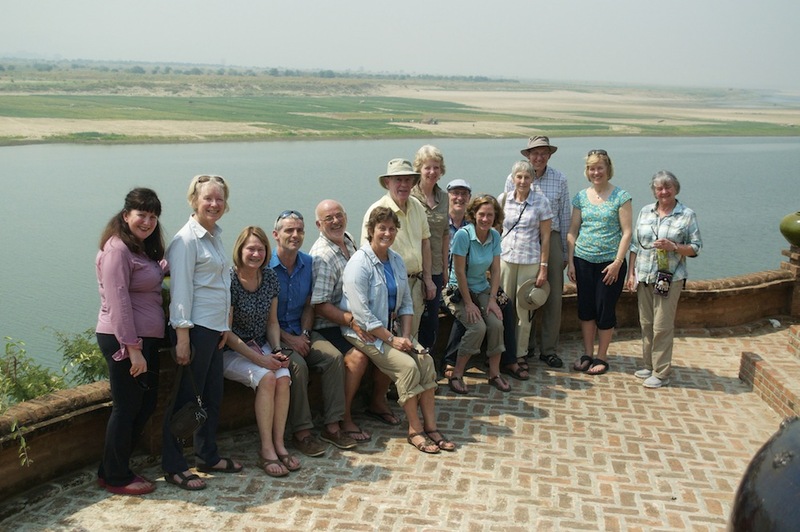 This was the first visit we made which we felt was a let down and I doubt I would recommend it to be included in any future itinerary. After lunch and our obligatory afternoon rest, which for many included a swim in the delightful hotel pool, we went to the nearby village of Min Mon Thu to have a look at their way of life. 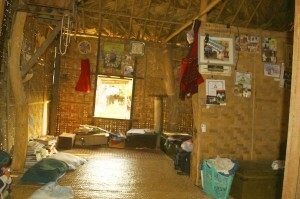 A chaperone took us around and we were able to go into their houses to see how basic their living conditions were. Again everybody was very welcoming. The houses are built on stilts. During the rainy season the sandy earth will become a soggy mess and as the houses are only made of woven palm leaves they would quickly deteriorate. They become little playgrounds for young children where they can come to little harm and are easily supervised. I guess, also, that by having the houses on stilts they are less likely to get snakes in the houses, of which there are several deadly species. We watched the various activities of the village and the tools they use in order to make themselves fairly self sufficient. Many revolve around hand crafts which they can either sell to tourists in the village or take to markets. One girl was making picture frames out of palm leaves, another was weaving, while more were carding and spinning wool, taken from their flock of goats which we later saw returning to the village. There were not many men about as they were all out in the fields with their animals or at market. 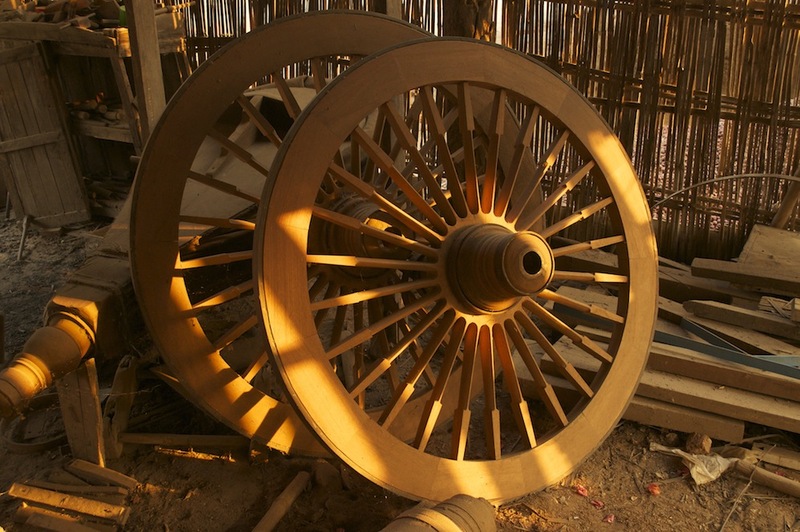 There was a wheelwrights in the village, making wheels for the horse and ox carts we regularly see on the roads. These are beautifully crafted. The old women of the village were smoking fat cigars, the tip of which was supported by half a coconut shell so that ash did not fall and possibly cause a fire with so much dry material about. It was fascinating watching them make the cigars dispelling the image of them being rolled on a dusky maiden’s thigh. Taking some dry leaves from a maize plant she cut them into shape. From a basket she took a mixture of tamarind, ground coconut and a little tobacco which she rolled into the leaves. One end she tied with cotton while the other had an extra piece of leaf attached. Both ends were trimmed with scissors and there you have it. I was offered one but declined. As we left young girls were carrying water containers on yolks from the nearby well, a heavy job for such young girls to be doing. For the sunset we went to another small pagoda, one less crumbly, and not often frequented. Again it failed to come up to promise and while the mist again provided atmosphere the actual setting was a disappointment. 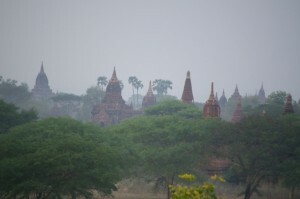 Our last day in Bagan was more relaxed, although a number of us chose the early sunrise start, leaving the hotel at 5.15. Arriving at Swesandaw we climbed the five flights of steep steps up to the top tier. Some if the larger pagodas were illuminated by floodlights which looked spectacular against the night sky. The rising sun failed to produce the colouration of the sky that we hoped for but again the rising mist created the most spectacle. 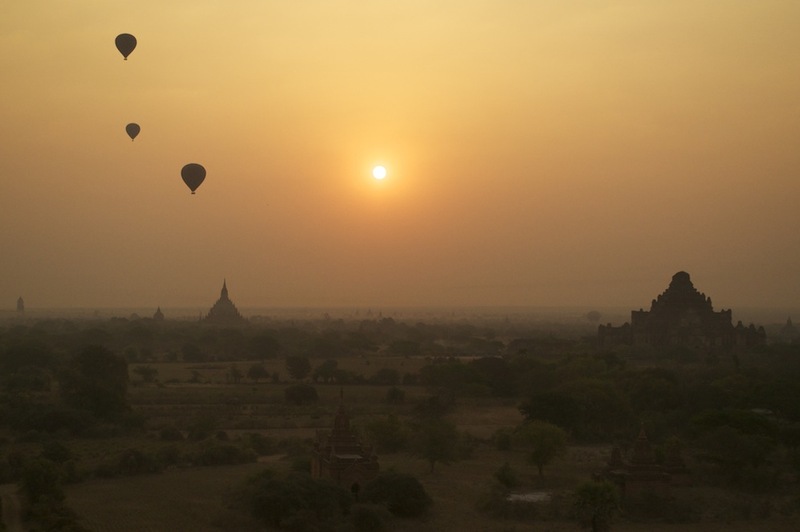 The balloons rising above the pagodas with the sun behind them added interest to the spectacle. Later in the morning we visited lots of small pagodas all clustered together. In the evening we took some beer to a small mound made up of thousands of broken pots. There had once been a village here that specialised in making pottery. This was the spoil heap. From here we watched the setting sun, which again was not spectacular but with a beer it did not really matter. It was perfect just absorbing the scene and occasionally you get a picture that makes the waiting all worthwhile. The horse and carriage just added the perfect touch. For our last evening we ate in the hotel garden beneath the pagoda. The setting for the hotel is perfect. 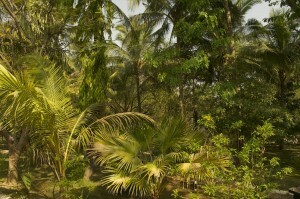 Accommodation is in bungalows each with their own veranda overlooking the garden forest of palms. A lot of wood has been used in the construction and decoration and this makes the rooms quite dark, even with the lights on. The room facilities are missing some little touches, the mini bar only has bottled water and the bathrooms are a little small and tired looking. The internet does not work and when it did for some it was very slow and only briefly. 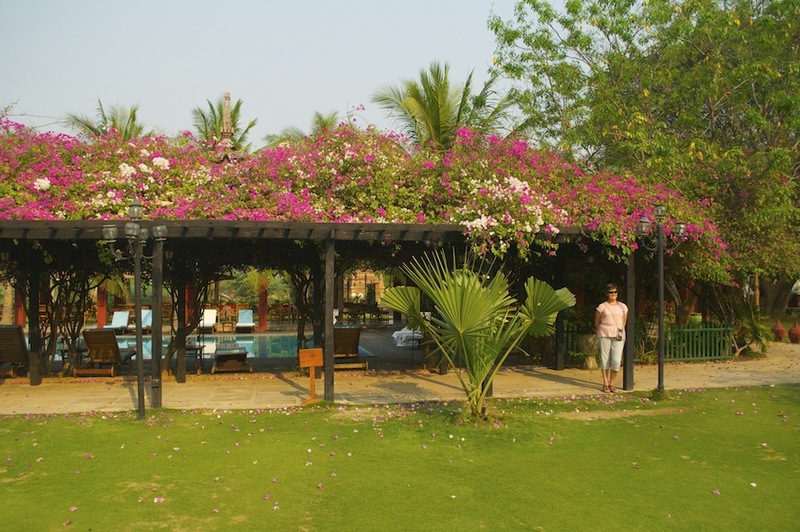 The outside facilities are excellent with a lovely pool and garden. The evening restaurant in the garden is excellent although the bar closes at 10.00 and they failed to serve me a coffee one evening. The breakfasts are adequate without being exceptional. The staff are mixed, some better than others. You got the feeling that some were not used to dealing with guests and had not been sufficiently trained. When we returned to out rooms on our last full day the boys who cleaned the rooms had decorated the beds with petals and leaves. On the bed was a note suggesting, without actually asking, for a tip. The following morning, while we were in breakfast they visited all our rooms and scooped up any tips before we had left. The positives far outweigh the negatives and I would recommend this as a good place to stay.